do you have any working example how to read the weigh for Dymo scales? Thanks for updates. Do you have any complete demos similar to your 2010 post? We are working on it. Unfortunately, I don’t have an exact date yet as to when it will be released. What type of demo site are you looking for? If you install our SDK, you’ll find a few various demos you can run via localhost. The link you just posted http://developers.dymo.com/category/dymo-label-framework/ just circles back to this same page. Would you kindly let us know the correct page? Have you tried the links at the top? There are PDF and DOC versions there. I really like the debugging functionality documented here with the trace() method and the error log. I hadn’t seen that documented elsewhere, so it is good to see it documented here. Thanks for all you do to help developers! No problem. Glad to see you’re happy with the debugging functionality! Could you see if this helps? What baffles me is if all clients are using the same exact versions of all software (the website, chrome, windows, and dymo client) why would it work only on some machines and not others? Have you tried starting Chrome with the –ssl-version-fallback-min=ssl3 option. Where exactly do I get the correct dymo.label.framework.js? The one in the sdk download is from 2011 and does not have the init method. What link are you currently using? Let me see what I can find for you. Is there an async alternative to `dymo.label.framework.checkEnvironment` ? I will look into this for you and get back to you as soon as I can! There are some interesting functions there though, it would be nice to learn about “printLabelAndPollStatus”! I am assuming that this is a complete list of methods on the most recent JS framework post Async? And that none of these have been changed or modified in the more recent versions of the SDK? but when I type https://localhost:41951 into the printer location (url) it simply tells me it cannot connect. Am I missing something or is the service not working? What exactly does the isBrowserSupported value mean these days? I’m seeing cases where we get a true value for someone using IE 11 in Windows 8.1 that has the Dymo Web Service software installed, yet the value for isWebServicePresent comes back as false and isFrameWorkInstalled comes back as true. In this particular case, they are able to print, but we would like to use these values to provide useful information. Any help is appreciated! What platform are you using to run the web service? All the samples do not work on chrome. “dymo.label.framework.js” is the 2011 verrsion. Where do you download the 2016 version of “dymo.label.framework.js” and code samples? They are not included in this article post. Invalid System.register call. Anonymous System.register calls can only be made by modules loaded by SystemJS.import and not via script tags. We don’t have any experience with Aerelia.io and SystemJS, but my first off-the-cuff suggestion would be to try naming all of your System.register calls. The request fails after 3.0s, which seems like a timeout. I guess we’ll implement some client-side throttling. I can’t think of any other way to work around this, can you? Also, is there any way that we could learn about this behavior of the webservice, or any way to find the meaning of the “-1” error message? I’d be happy to read some documentation, but I haven’t found it yet! dymo.label.framework.openLabelFileAsync doesn’t seem to work correctly. I have tried a variety of methods and I can only get the synchronous version to work. Anyone have any success?…any snippet would be much appreciated! It seems there isn’t much time!!! – Invoking ‘send()’ on a sync XHR during microtask execution is deprecated and will be removed in M54, around October 2016. See https://www.chromestatus.com/features/5647113010544640 for more details. Can you post examples of what you have already tried that do not work? Did you ever get this sorted out to move over to the Async requests? is there any possibility to send the request via POST with curl e.g. In which format do we have to send the request to the Web Service Proxy ? What URL are you trying to use? What data are you trying to send via POST? It prints,but not at same place as when I do it through DLS although I use the same xml label model. How can I change the top margin of the printing programatically ? Going trough most recent post I havent seen a way of specifying the host address where the web service is running which is a windows machine. I can’t get DLS installed on Max OS X El Capitan. On Windows I need to select express install. How do I do that on a Mac? I am running 10.12.6 (Sierra). I have 8.6.2.134. I cannot get the web service to start up. The Dymo Label app works ok.
DYMO framework error details: DYMO Label Plugin is not installed. I’m trying to print a ContinuousLabel on a 450 Turbo. I found the example here for continuos labesl. The unique label ID. All label IDs are defined in Labels.xml. I, personally, am not too familiar with that SKU. But I opened up DLS and tried creating a label using it and it seems to work. The best way to figure out how labels work is to run DLS and create a label there. Open up the label file and see what’s in it. Then you can import it into your project. Labels.xml is not a publicly available file, so inspecting label files you create with DLS is your best bet. Is there any way for me to learn what this error means? Updating my code to use v2 of the Framework and have it working cross browser however I’m experiencing an issue with Edge. Any ideas as to why Edge isn’t finding the framework when all other browsers are? After some more investigation, it seems that it is a problem with Edge using HTTPS. Working on HTTP. This issue does not occur on MacOS – the label renders correctly. Is this a known issue? How may I resolve this issue? As a follow up to this, it appears this issue may have been introduced with DLS v 8.6. After uninstalling 8.6 and installing 8.5.4, the issue is rectified. It appears v 8.6 also completely removes the Dymo browser plugin for Firefox and Internet Explorer (in Windows). I tried uninstalling and then reinstall but still no browser plugin. Then I uninstalled v8.6 and installed v 8.5.3 which we had been using and voila! Dymo plugin is back and working just fine in both Firefox 45 ESR and Internet Explorer 11 (both in 32-bit mode) on Windows 7. Unfortunately we need this functionality for a web-based POS and inventory system (ShopKeep BackOffice) that supports only Dymo devices. dymo dev – I am utilizing the web service in my application but getting the error mentioned above with upgrade to 8.6. Do you have any information?
" The calling thread must be STA, because many UI components require this. " YMO.DLS.Printing.Host.exe Error: 0 : WebMethod call failed: The calling thread must be STA, because many UI components require this. We are aware if this issue and are actively working on a fix. Stay tuned… For the time being, you can remove Image objects from your labels if possible as these are the root of the problem. Labels without images should work just fine. We’re also having increased reports of failures! I guess we’ll tell our customers to reinstall the old version. Our new DLS release should fix this. I’m running into an issue where calling the openLabelFile from the Dymo.Label.Framework.js framework causes Mac-specific problems. To be more specific, openLabelFile(“myURL”) is supposed to execute a GET call to my server which works fine on Windows. On Mac however, the call’s parameters are stripped for some reason, resulting in my server not getting the proper label names and whatnot. I’ve tested this on Firefox, Chrome and Safari and they all exhibit this issue. I know the parameters are getting added to the request as I’m printing out the URL right before I hand it off to ‘openLabelFile()’. Something is going wrong inside that method but I can’t debug it very well as it’s inside your minified framework. I’ve tested this on both versions 8.5.3 and 8.6 of your DLS software and it’s occurring on both. I’m using the latest version of the Dymo.Label.Framework.js framework as well (2.0.2). I’d very much appreciate some help with this. In the meantime, I will look into this and see what I can find. I am trying to figure out how to use the getPrintersAsync function. I’ve checked your new examples, but they are all using the old functions. Is it possible to update your examples to the Async functions or to give me any examples how to get it work? I agree with this. All of the examples are sync and we need async for some of the less experienced coders out there that are unable to compare the Google’s promises conversion and relate it to the code on the website here which are structured completely differently. I try to render label PNGs (as from your example) from 3 labels. I’ve tried different label-files. I even tried to render the first one, for a second time. Whatever I try the error occurs. It seems like the script is only able to render two previews. What script are you referring to? Is this one of our samples or something you wrote? What version of our software are you using? Is it just me or is there no option to not install the web service with the latest Dymo Software 8.6? We will be releasing an update soon to address this. I wold like to remove DYMO LABEL WEB service from my mac , but I don’t see the icon or program on finder ? You have to run the uninstaller. Are you able to provide more of a defined timeframe for when you expect the update to 8.6 to be released? Are goal is to have a release by the end of this month. With the end of the month soon approaching, do you think you will meet this goal? Any chance of a Linux version of the Dymo Proxy? There is talk about Linux support some time in the future but I haven’t heard anything concrete. I’d second this “opportunity to excel” !!! Or any sort of sample code we can port ourselves. Hi There, I can see my my setup is up and running when I check https://myserverip:41951/DYMO/DLS/Printing/Check when I sit behind my server and use my server browser. However I get no response when I use above link on any of my tablets/computers within my local network. Are you able to “ping” your server from any other device on the network? Could someone please help me on previous question? I have an increasing number of customers using various versions of Windows who are experiencing issues with DLS noted above in my previous posts. Can you please provide an update on timeline for the proposed fix, as well as some information about what is being fixed? Ping! Please provide an update on the status of the issues with 8.6 and if/when an update will be ready to address them. I’m not a developer — and this annoying menu item just showed up when I upgraded to the latest Dymo. Where are the instructions to get this unwanted junk off my Mac? Very bad usability. To what menu item are you referring? Sorry but the documentation is incorrect. The web service isn’t optional. You can’t even select it. The number of customers who are affected by the inability to build labels with images is increasing. Can you please provide some sort of update on your progress to identify and resolve this issue? Can you please post details regarding the problem you are having? Please see comment #22 above and associated thread, originally posted on 11/30/16, for full context. The release that fixes this is in QA right now. Thanks. Assuming all goes well, how soon do you think this will be released? We have the same problem with Edge browser. All works fine in IE, Chrome and Firefox. I am using DYMO Label Framework Plugin in my website to print label. I have added js “http://labelwriter.com/software/dls/sdk/js/DYMO.Label.Framework.latest.js” in my web page. When I click “Print” button, an alert says “DYMO Label Framework Plugin is not installed”. What OS are you using? Can you let me know what you have installed so far? Please provide a screenshot as well. I ran into a similar issue, the certificate being used by the Dymo webservice was not recognized as being valid. In Firefox, click Advanced, then “Add Exception”, “Confirm Security Exception”. In Chrome, click Advanced, then click the option to proceed. I really like the framework but think it lacks good documentation. How is everything going with the update to fix the RenderLabel request issue? Please see the tag. It causes it to break (400 Bad Request). This however, used to work 100% just fine with the NPAPI plugin, and it works if you right click > load in the Dymo Label software. Must call Write before calling EndBatchWrite. DYMO.DLS.Printing.Host.exe Error: 0 : WebMethod call failed: Printing Error: Object reference not set to an instance of an object. For some reason, if you replace blah blah with a prefab label like 30252 Address it works and doesn’t complain. This is a major issue and any help is appreciated. What version are you using? Have you tried doing a clean install of our latest release that just came out? Since, the label has htmltag formatting, pastebin link for the label I’m trying to print is HERE any [ Tagname ] should just be read as proper XML. This form is cutting/trimming anything that resembles HTML. BUT, when trying to use the web API it does _NOT_ work. For some reason, if you replace in the label file itself – [ CustomPaper ]blah blah [ /CustomPaper ] with a prefab label size like [ PaperName ] 30252 Address [ /PaperName ] it works and doesn’t complain. The error code is 400 BAD REQUEST and the actual log of the error is written below. I am unable to figure out how to proceed here, as standard label sizes are not helpful. Are you trying to generate the XML yourself or are you using our SDK to generate it for you? Hello, I am not able to print labels with the ‘CustomPaper’ tag, only generic Dymo labels seem to print. Everything else results in a ‘Bad Request’. Example of a problem label that worked previously and loads fine in the label software is linked below. Are you trying to create a label file manually? If not, how are you generating your label files? What version are you using? The only manual part of creating the label is altering the size of the label by using that tag. Once saved in an outside editor it can be loaded just fine into the current version of Dymo. From the pastebin above, I should note that lines 5 and 12 were accidentally included and to exclude them if testing. // How to load to ILabel above Image Stream? As of recently, Chrome 58 (MacOS 10.11.6) will not go to https://localhost:41951/DYMO/DLS/Printing/Check as it fails the security SSL checking. We have a fix that is being tested today. Any updates on this? we have the same issue. YESSSSSSSSSSSSSS thank you for this article! Hello folks – any input on how best to print to a Dymo printer from a java SE application? I tried printing with built-in core APIs and the result is hit and miss, not to mention, conforming to a complicated label layout makes it even more interesting. Anyone here have similar experience? If yes, could you reply back with the approach that worked for you. Thanks! Our SDKs are exposes as COM objects that you should be able to use in your Java application. Take a look at some of the High and Low level COM samples in the following sample to get an idea of how the COM SDK is uses. We unfortunately don’t have any examples specific to Java. Thanks you for your response. I failed to mention that my application needs to run exclusively on OSX, so I’m not sure using COM objects is an option, unfortunately. Having issues connecting to Web Service but can print fine with the Dymo App. 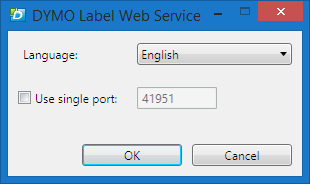 Can you ping the DYMO Label Web Service? You can check the port number by using the tray application. If there is no DYMO Tray application, you will need to start it. The Tray application is the web service. I’m managing a WIndows 2008 RDS farm. Only a couple of users have a local USB Dymo labelwriter. How to prevent the “DYMO.DLS.printing host.exe to load for everyone logging in one RDS server ? (20 users means 20 occurrences of that… thing). BTW they are using the native software to print locally on USB… Is that “web service” required ? The DYMO.DLS.printinghost.exe is an out of process COM server, so it will show up (briefly) for every user. Nothing you can do about that. Trying to print the labels from local PC (web page) while using the Web Service feature from Web Server (IIS). Somehow the connection is not making it possible to print the labels. Do you have a sample project that has a working code to compare please? Thank you so much! Going to try out this and let you know if hits a wall! Really appreciate getting back so quickly! Hi friends. I print from my web application ok, but, i need chech if job status is ok. I read the info into this blog, but my labelwriter response “not implemented”, and code still in loop because result is true all time. Can you give some background on this code snippet? Is it running as part of an Asp.Net page? I get the same status code: ‘not implemented’. I am running on a php backend, and both Chrome and Firefox have the same issue (not tested with other browsers). The Dymo printer is connected to a print server, not locally. Does your code work if the printer is directly connected to the client machine? So I read in one of the posts that the web service is confined to localhost for security reasons. I also saw someone on this blog post ask about a year ago about being able to print from a tablet. I’m trying to do something similar. I can print from a web page on the computer that the web service is running on just fine but I’m trying to figure out a way to be able to do the same from a tablet/phone on the same network either to a Dymo printer hooked to PC or to the Dymo wireless version. Is there a way to get this to work? Thank you. We have no built in way of printing using a tablet. You could create a proxy service on your pc for printing if you would like. Thanks. The could work but we’re trying to make something that runs on a website for customers to use who have Dymo printers to print the labels directly from the site. A lot of the customers would be running the web application on a tablet/phone at home and trying to make it as simple as possible, hopefully without them having to worry about doing any major configuration or install anything additional. Joe, we do not have a timeline at the moment for releasing mobile versions of our SDK. Hi, service was printing in 2 seconds before but now PrintLabel call takes over 18 seconds. Could someone help me on that. Could you please let us know when the fix is out or the status of it? Some of my users are also experiencing this. While the temporary fix works on my end, I would like to not have users go through the additional steps to tweak their firewall. We will put out a new blog entry so that everyone is informed. We are in the QA cycle now. It might still be in a QA cycle — but for me, personally, that update fixed the problem! I’ll still keep an eye on this thread. Ron, could you please explain the above comment in more detail? We’re currently running windows 10 and we too are experiencing extreme slowdowns. How do we implement the above in simple terms? Could you give a step by step instruction list, thanks. So far everything is working great, but is there anything preventing malicious websites from accessing and printing with my DYMO if they find it? or is the problem that then() doesn’t return the promise as it should? For example, I’m rendering a long list of labels. If I renderAsync in a loop, it gets exceptions (probably too many queued up labels, or this may be another error regarding timeout). How to use DYMO DLS SDK with VB and MS Access Sample, Samples, Samples!! !